Concrete and natural stone are popular options for the floors or walkways in Arizona homes. The concrete and stone have a beautiful look that complements the Arizona landscape, and they are easy to maintain. They are also durable and long-lasting, which saves homeowners a lot of money on repair and replacement over the years. A home’s garage can start to look like the garage in an automotive shop over the years. Oil, gas, and other automotive fluids can drip onto the concrete and cause indelible stains and odors. The floors can make it very unpleasant to be in the garage. The odor may become overpowering, and you may not want to go in there without shoes on – and sometimes not even then. You can hire an epoxy flooring contractor in Chandler to apply the coatings to your garage floor so that these stains and odors never appear. The epoxy keeps these chemicals out so the concrete does not soak them up, absorbing odors and starting to break down. The epoxy also has fire retardant chemicals, which improves safety in an area that has so many flammable items, including household cleaners and paints that are often stored in the garage. If your garage floors are already stained and corroded, you can hire a contractor to clean and resurface the floors and then add the epoxy flooring. Tile is a popular choice for kitchens and bathrooms, but it is prone to mold and mildew, especially in the grout. The grout can break down, and water can get under the tile, the baseboards, and the walls, spreading mold to other areas of the room and the house. Concrete is a good alternative for these rooms, but many homeowners don’t like the dull look. The floors are also still vulnerable to water damage in the form of degradation over time, such as spalling or cracking. Chandler Epoxy flooring can take care of both problems. Not only will it give the floors a sophisticated polish that homeowners enjoy for their kitchens and bathrooms, but it also protects the concrete against water damage. The epoxy resin is impermeable, so it doesn’t allow water to penetrate. It keeps the concrete smooth and protects its longevity, helping homeowners save money and to enjoy their floors longer. Let’s be honest: Bare concrete isn’t the most attractive of surfaces. It’s totally practical and functional for surfaces like driveways and walkways, but it isn’t something you necessarily want in your home. But when you move in to a new home, you don’t really have a choice about what the previous owners installed (or left there from the owners before them). Installing epoxy floor coatings can improve the look of the concrete and make your home something that you’ll be proud to show off to guests. Epoxy flooring can also be stamped, stained, or textured to take on a variety of looks. An epoxy flooring contractor can make your dismal concrete floors look like travertine, flagstone, hardwood, and other luxury materials. A simple coating can completely transform the look of your floors. Floor coatings are a great investment for your Arizona home. They will protect your floors from damage, save you money on repairs, extend the life of the floors, make them easier to maintain, and make them easier to look at. Consider contacting an epoxy flooring contractor to upgrade your home’s floors. 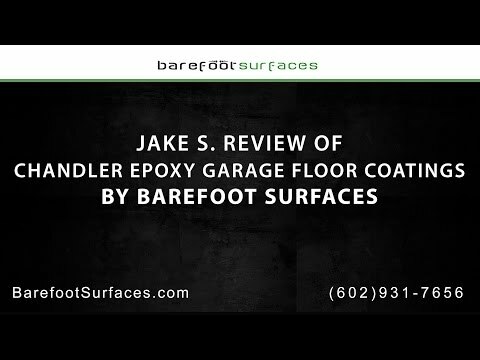 Barefoot Surfaces installs all types of epoxy floor coatings in Arizona homes, including metallic epoxies, stained coatings in Chandler, stamped coatings, and more. We install floor coatings in garages, kitchens, bathrooms, and any other room of your home where you have concrete floors. We also install the coatings on driveways, patios, walkways, and other outdoor surfaces. Call us in Arizona to schedule an estimate or check out our gallery of epoxy flooring on our site.